We all know that sunburn and blisters aren’t good for our skin – but few of us understand exactly why… With baffling terms – SPF, UVA, UVB – and endless (and often conflicting) advice being offered in the lead-up to summer, protecting ourselves from the sun’s harmful rays can all get a little confusing. So this week, I have decided to shed some light on all those aspects of sun protection, so you have shopped, packed, and applied before stepping into the sunshine! Sunlight is made up of two different types of rays; UVA and UVB. But what exactly is the difference? UVB rays are the shorter rays that cause sunburn and can potentially cause cancer. UVA rays are longer rays – less likely to cause sunburn, but they penetrate our skin and can alter our DNA. This can cause premature aging (such as wrinkles and discoloration) and thickening of the skin (that horrible leathery look), which the skins does to protect itself, essentially piling up dead skin to act as a barrier from the sun. Tip: Always seek the shade between 11am and 3pm when the sun’s rays are stronger – and invest in the best quality sun cream you can afford, to protect you from both UVA and UVB rays. I love Lancaster Monaco Sun Beauty Care SPF30, £13. SPF stands for “Sun Protection Factor” and it measures how long you can stay in the sun safely. For example, SPF15 means you can safely in the sun for 15 times longer than you could without wearing it. Tip: The level you picked depends on your skin’s own resistance to the sun, but Sally Penford of the International Dermal Institute recommends that everybody should wear “at least SPF15 for protection against UV and to protect the body’s own immune system”. Clarins Sun Care has a vast range of SPF ratings, with high quality broad-spectrum protection, from £13.06. Should I use sun beds before my holiday? 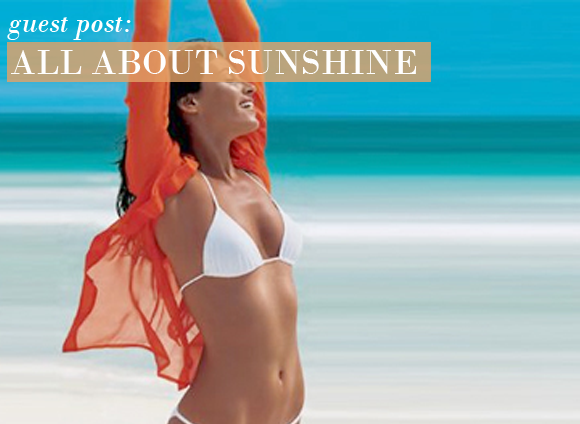 No – step away from the sun beds! There’s a common misconception that using sun beds can help to build up a tan safely before a holiday, but there are few worse things you could inflict on your skin. In fact, regular use of sunbeds can increase the risk of skin cancer by up to 75% – they are just as likely to give you cancer as smoking and asbestos. It’s like lying under the sun without wearing SPF, which most of us would never consider. Tip: Why not turn to Fake Tan to get your pre-holiday colour? Not only will it look great and help you feel more confident on the beach, but it will make the sunbathing seem a little pointless when you are there. If you can look great from a bottle, why bother roasting your skin in the sun for hours? I still love the original and best; St Tropez Bronzing Mousse, £19.20. Why bother with After Sun? After Sun works in three ways – it soothes, repairs, and protects the skin against anti-ageing. Tip: Keep your bottle of After Sun in the fridge for an extra soothing and cooling treat! One of my favourite products for post-beach is Vichy Capital Soleil After Sun Balm, £11. This Sun Beauty Care cream is so easy to apply and leaves my skin feeling soft and moisturised. I have very sensitive eyes and find that this is the only facial sun protector that I can use without looking like I am crying all the time! I have used this product both in the tropics and at home. It has never let me down. A little goes a long way so the tube lasts for ages too. This entry was posted on Monday, July 18th, 2011 at 8:35 am and is filed under Guest bloggers, Sun and Tanning. You can follow any responses to this entry through the RSS 2.0 feed. You can skip to the end and leave a response. Pinging is currently not allowed.